Show off luxury on your wrist with this stunning Philip Stein watch from the Classic collection. A luminescent Mother-of-Pearl face showcases a single time zone dial and subdial with yellow gold accents while being encased by smooth yellow gold-plated stainless steel. Interchangeable straps in 18mm are compatible with this gorgeous watch and treat you to a plethora of choices with your wardrobe. The Natural Frequency Technology, which is housed in the watch's case, will keep you balanced and relaxed throughout the day. 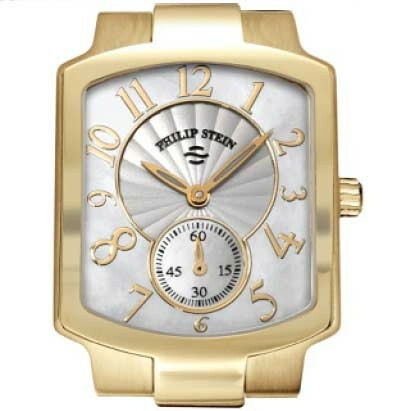 Embrace your fashion side with this fabulous Philip Stein watch. Watch straps are sold separately, and JR Dunn has a 10-day satisfaction guarantee for all Philip Stein products.